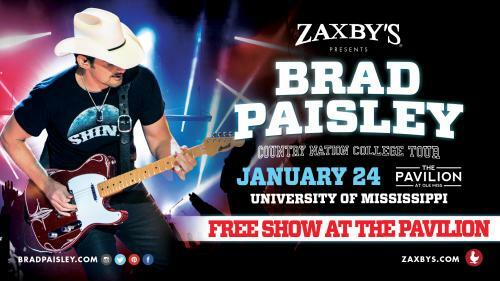 NASHVILLE, Tennessee (December 3, 2015) Brad Paisley will take his highly successful Country Nation College Tour presented by Zaxby’s to the University of Mississippi on Sunday, January 24 as part of grand-opening festivities for the Pavilion at Ole Miss. Admission will be free with seating on a first-come, first-serve basis. Floor seating will be reserved for Ole Miss students. More details will be announced soon. Ole Miss will become the tenth IMG College-partner school to welcome Paisley this semester, following capacity-crowd performances and free entertainment for the campus community at nine IMG College partner universities. Paisley’s current single “Country Nation,” is in the top 20 on the country airplay charts and is the newest single from his chart-topping album, Moonshine in the Trunk album. “Country Nation” was written by Paisley and his longtime collaborators Chris DuBois and Kelley Lovelace. A celebration of the blue-collar spirit and America’s passion for sports, the song weaves-in a shout-out to 18 college sports mascots. Brad Paisley is a critically acclaimed singer, songwriter, guitarist and entertainer whose talents have earned him numerous awards, including three GRAMMYs, two American Music Awards, 14 Academy of Country Music Awards and 14 Country Music Association Awards (including Entertainer of the Year), among many others. He has been a proud member of the Grand Ole Opry since 2001. Paisley has written 20 of his 23 #1 singles with the first being his 1999 hit “He Didn’t Have To Be” and his most recent, “Perfect Storm,” from his chart-topping 2014 album Moonshine in the Trunk. In support of his current hit, “Country Nation,” Paisley recently completed his Country Nation College Tour presented by Zaxby’s, which included various stops at college campuses around the U.S. On January 21, he’ll launch the 2016 winter leg of his highly successful Crushin’ It World Tour, continuing across the U.S. and Canada during the winter months with special guests Eric Paslay and Cam. Paisley has partnered with Boot Barn® and developed an exclusive line of jeans, hats, T-shirts, jewelry, belts and woven shirts called Moonshine Spirit by Brad Paisley. Connect with Brad at www.BradPaisley.com,www.Facebook.com/BradPaisley, on Twitter @BradPaisley, on Instagram @Brad Paisley, and YouTube at YouTube.com/BradPaisley. The state-of-the-art, $96.5-million Pavilion at Ole Miss opens in January 2016 and is more than 225,000 total square feet. Home to the University of Mississippi basketball programs, the facility boasts a capacity of 9,500 and features a number of first-class amenities, including courtside and baseline seating for students, three premium club areas and more than 1,700 premium seats all within an intimate seating bowl. Other highlights include the largest center hung video display in college sports with approximately 2,255 square feet of active LED display space and a social area with retail space, a food court, a ticket office and a cutting-edge, fiber optic-enabled Wi-Fi lounge through partnership with C Spire. The south end of the Pavilion is a five-story parking garage with 800 spaces that services the entire university community.